We love these Jute Knotted Bottles and they will give your bottles and jars a designer touch that won’t break the bank. Check out the ideas and watch the video now. We love anything that is super simple and this easy DIY certainly ticks all the boxes. 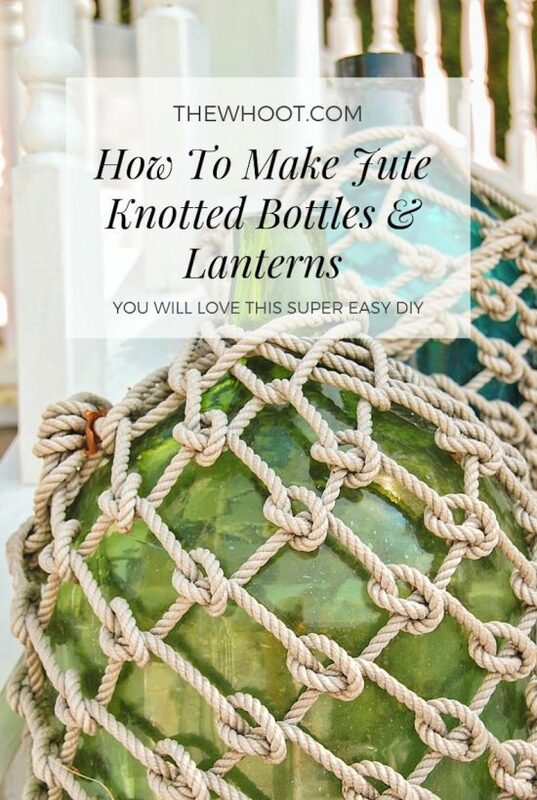 You will never throw out a bottle or jar again when you can create such a stunning, inexpensive effect! 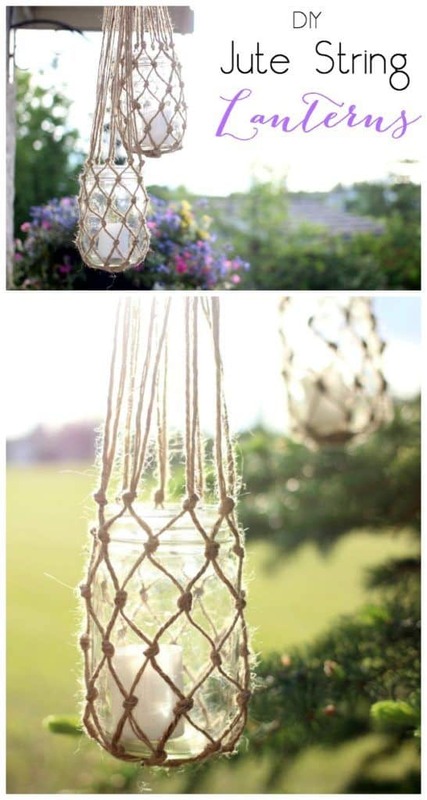 You can use this fishnet string technique on so many items including vases and mason jars and won’t they make the perfect planters and lanterns! Group them for a truly unique look. This Infographic from Fixx steps you through the process of making Knotted detail for your Mason Jars. We love the idea and they will come in so handy! You could also add a tea light or candle. Hang them from a tree as a garden light or use them for a party light or table centerpiece. You can even add shells or a starfish to create a beach theme which works especially well in a bathroom. We have included a short video from Love Create Make that shows you just how easy it is to make these gorgeous lanterns. 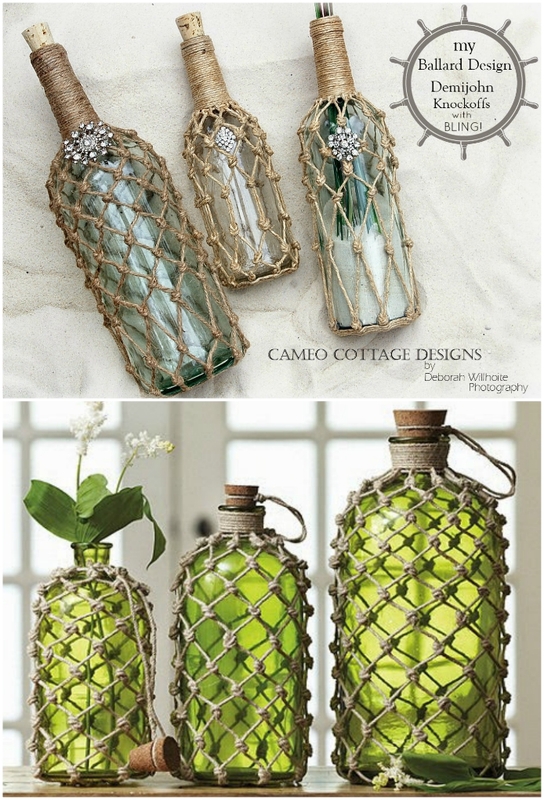 You can also add embellishments to your Knotted Jute Bottles as shown above by Cameo Cottage Designs. The creator, Debi, saw the green bottles above in a Ballard Catalogue and decided to put her own spin on the idea. We think hers turned out fabulous. The faux fishnet looks stunning and it’s so inexpensive to make. This idea comes to us from It all Started with Paint and we know that once you start, you won’t be able to stop. This is a relaxing craft that will keep you entertained for hours. These cute hanging lanterns from Love Create Make are featured in You can hang them in trees for a wonderful ambiance in your home and garden. It will bring any favorite space to life. 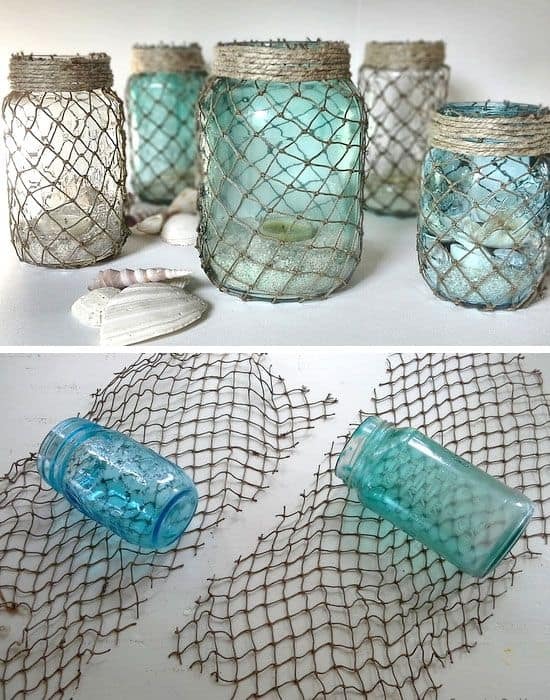 These Fisherman Netting Jars make perfect lanterns, and again, you can see just how easy they are to recreate. This a lighter material but looks equally attractive. We found them on Sow and Tell. 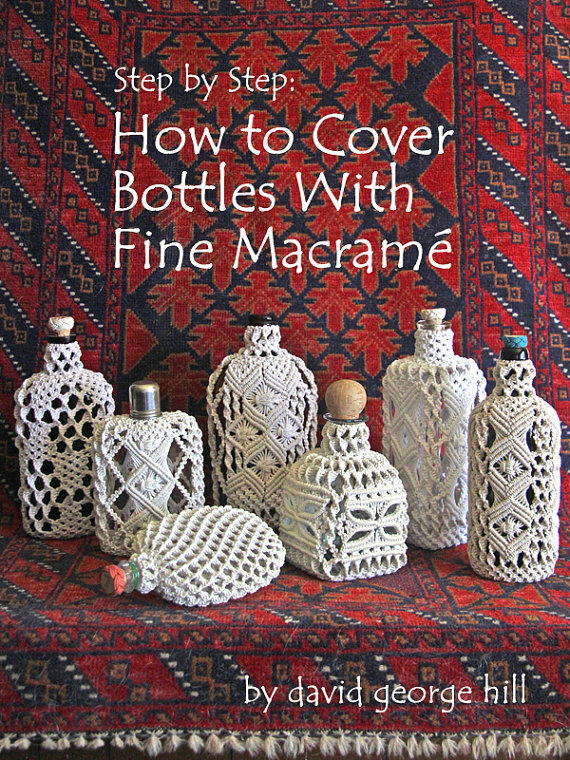 Another popular idea is to cover your bottles with Macrame. There is a very popular book available on Etsy that we highly recommend that has some wonderful projects in it.